ANS Performance RAVE is a nootropic preparation containing vitamin B6, taurine, acetyl L-carnitine, N-Acetyl-L-Tyrosine, choline bitartrate, caffeine, l-theanine, and Hericium erinaceus fruit extracts (MagicLionTM), Huperzia serrata plant extract, Astragalus root (QiForceTM) and Nelumbo nucifera flower. The preparation facilitates an increase in mental activity, sharpens concentration and improves cognitive intelligence. Nootropics are a relatively new class of ingredients that increase mental performance. They affect, among others, memory, attention, concentration and enable multitasking. These features determine the ability to survive and develop in today's dynamic world. Unfortunately, many people are not able to cope with the demands posed by the current pace of life characterized by a multitude of information and stimuli from the surrounding environment. Our cognitive abilities are limited, and the presence of distracting factors present at work, at home, on television, on the Internet, in social media, and mobile devices creates an environment in which the depth of penetration of any single information is very shallow. We are aware of many things happening around us, but we do not understand and remember everything. Often, in order to cope with the hardships of everyday life, we need appropriate concentration, considerable mental energy reserves and cognitive abilities at a high level. Here comes ANS Performance RAVE, which contains a composition of ingredients with properties that improve cognitive functions, increase motivation and improve motor function. Taurine is a naturally occurring amino acid that acts as a neurotransmitter with a positive effect on the functions of the central nervous system. Taurine is responsible for loosening muscles and reducing their excitability, due to which it is used as a substance that improves regenerative processes. Taurine supplementation supports the improvement of cognitive functions, which makes it a perfect ingredient matching other compounds of the preparation. Acetyl-L-carnitine is a modified version of L-carnitine, which can penetrate the blood-brain barrier and support the formation of acetylcholine. Acetylcholine is an important neurotransmitter that increases mental energy, provides better concentration and the ability to focus and remember. Participating in the transmission of signals between the nerve and muscle cells, acetylcholine is responsible for the performance of the muscle apparatus. Another element of the product that can also increase the amount of the available acetylcholine is choline bitartrate. The preparation has been enriched with an extract from the whole plant – Huperzia serrata, which is a rich source of huperzine A. This substance is an inhibitor of the acetylcholinesterase enzyme that breaks down the neurotransmitter – acetylcholine. Huperzine supplementation is used to improve memory processes and learning skills, as well as to improve concentration. N-Acetyl-L-Tyrosine is characterized by a better bioavailability than regular L-tyrosine. It helps to relieve stress, improve well-being, improve the ability to focus and reduces fatigue, which results in an increase of both mental abilities and those associated with physical activity. It increases the production of neurotransmitters, such as dopamine, norepinephrine, and norepinephrine, whose action is required in the energy mobilization of the system. MagicLion ™ is an exclusive extract of Hericium erinaceus mycelium, which is rich in naturally occurring compounds that enhance cognitive functions and support the health and functioning of the nervous system. Hericenone and erinacine are triterpenes, which are strong natural inducers of NGF (nerve growth factor) synthesis in the nervous system. NGF is a protein that plays an important role in maintaining, surviving and regenerating neurons in both the central and peripheral nervous systems. NGF deficiency contributes to the gradual deterioration of cerebral neurons and the associated decline in cognitive skills. Nootropic preparations include caffeine that reduces the subjective feeling of fatigue. In classic pre-workout products, caffeine acts as a stimulant that increases the body's exercise capacity. L-Theanine obtained from green tea has a calming and relaxing effect, reduces anxiety, and in combination with caffeine may increase the ability to concentrate and focus. QiForceTM is an extract of the Astragalus root which is an adaptogen that supports the immune system, has antioxidant properties and displays neuroprotective effects. Astragalus supplementation contributes to the overall improvement of health. The Nelumbo nucifera flower contains higenamine, which as a β2-adrenergic agonist increases the availability of oxygen, as well as the level of energy and improves the sharpness and clarity of mind. The preparation contains vitamin B6 in the form of pyridoxine hydrochloride, which is more resistant to degradation and has a significantly better solubility in water, due to which it is absorbed better by the body. Pyridoxine is involved in maintaining the proper metabolism of energy components as well as well-being and mental health. 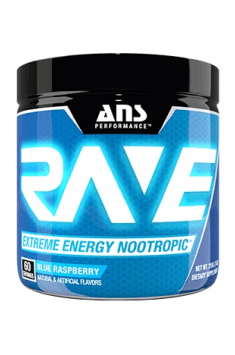 In summary, ANS Performance RAVE is a dietary supplement that is intended for anyone who needs to increase mental activity. The preparation strengthens all aspects of cognitive functions and enables a better connection between the nervous system and the muscle apparatus, thus improving physical performance. It is an ideal preparation for taking both before training to increase the intensity of training, as well as when learning or working at a desk, in order to improve cognitive skills and focus. Mix 1 scoop (3.5g) of RAVE with 6 oz of cold water and consume 15-30 minutes before mental activity. Do not exceed one portion of the product when used for the first time. The tolerance should be evaluated prior to the increase of the dose. The dose can be increased to a maximum of 2 measures (7 g) per day. Do not take within 4 hours before the intended sleep. The product should be supplemented during the day and only on those days when increased intellectual performance is required. Depending on the individual needs and length of the planned mental or physical activity, take one larger dose or two smaller ones. Maltodextrin, Citric Acid, Natural and Artificial Flavors, Malic Acid, Sucralose, Silicon Dioxide, Acesulfame Potassium, Blue Spirulina (color).